Kaneohe Single Family Home. Remodeled w/views. 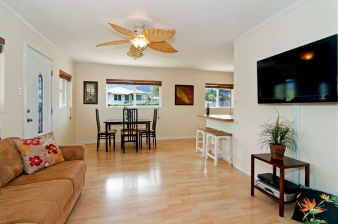 Great value for this Single family home in Kaneohe with Koolau Mountain views. Remodeled in 2005 with new copper plumbing, new electrical, new laminate flooring, and upgraded kitchen. Upgraded in 2009 with double-wall construction and new double-pane windows, split A/C, and composite front porch entry. New bath in 2011 with tile flooring, and new shower/tub. Bonus office area and utility/laundry room near kitchen. Outdoor coral-tiled lanai/patio area with water feature. Great for outdoor entertaining and grilling. Fully fenced yard. Extra storage. A must see property! Easy access to MCBH, shopping, public transportation, Likelike, H-3, and Pali Hwy.